After electing to not do white on my Deathwing, I had to figure "how" I was going to paint the black. Here's what I've come up with. I know, I know, not another one of these things. I promise I won't keep doing this forever. I'm almost done figuring it out. It's part black, part zenith line highlighting, part battle damage, part weathering powders. It's a lot of things at this point. Actually the battle damage is a little excessive on this guy, but I was trying something out. Here's my inspiration for my scheme. I want this part weathered, part battle damaged look to my guys. I think it's doable. Obviously it is given the nice Templar Predator above. I think I'll need to start with a nice black basecoat followed by some clean zenithal type highlights along the edges. Then a little bit of wear and tear in the form of battle damage and paint chipping. Go back in with some washes and add my grime streaks and stains. And then follow all that up with some selective application of weathering powders and I should be all set. If I do it right, they should look weathered and part of the environment they're in (matching their bases perfectly). That's the big challenge for me. Making them look like they're part of the world they're in. I want them to look like they are part of a bigger world. So let's see an actual example then. The process went like this. NOTE: Only the helmet, chest plate and his left leg were painted. Basecoat other element such as eyes, ornamentation, etc. All elements are painted completely before weathering powders are applied. 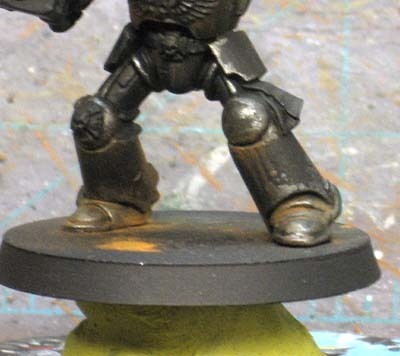 Line highlight the armour edges. This was done in four steps. Dark grey, medium grey, light grey and then a clean up with black to really get the highlights sharp and consistent. Each highlight covered slightly less surface area so that the final highlight was almost like a spot reflection. The line highlights almost disappear by the end in some places, but in the areas they are still visible after all the other treatments, they give the armour plates some much needed definition. Add paint chipping and scratches selectively. I use a gunmetal metallic here. Some people vary the chips using a darker metallic and a brighter one. I may try this later on, but for now, I like the worn look and it helps push them to the background as well. The light still catches them at the right angle so I'm not too worried about it. Wash grime streaks and stains onto appropriate spots. This adds the grime from joints that leak and such. Have to be careful not to overdo it with this step. Add weathering powders to simulate environmental conditions. I use three colors of powders (from Secret Weapon Miniatures) for variety. A light tan overall, a rust brown color and a rust orange color. I apply them with a tiny brush in the area I want them. I go back with a larger brush and remove most of the excess. Actually, most all of it. Then I take my finger and remove the stuff on the surfaces I can get to. This leaves the majority of the powders collected in the recessed areas as dust and dirt would be prone to do in real life. If I find I need to clean up some area for any reason (too much powder), I use Devlan Mud wash and go in an "erase" part of the wash. Using the Mud color doesn't kill all of the powder, but allows me to remove some of it in case I went overboard. I didn't want to use black paint because after my original basecoat, I don't use black again except to clean up the line highlights. I'm afraid that by using black, it would create a "clean" spot on the model and I don't want that. There's just one problem left. I do not know how to paint the Deathwing icon on their right shoulders. I know it's red and I can paint "red," but that doesn't help me any. I want to paint it so it looks like something and not just "red." Here's what I mean, their armour is painted to look like metal, the Terminator crux will be painted to look like stone, but their sculpted icon... what do I do with that? If you've got that answer, please let me know. It's all that stands between me and a finished paint scheme. 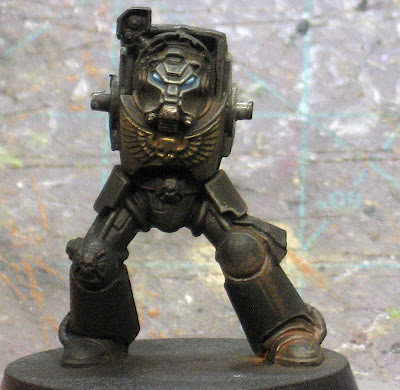 You need some Dark Angels Green on him somewhere; flex-ribbing at the joints possibly, or maybe background around/behind the chipped-metal red DA icon? Flekkzo: Red marble would definitely be interesting looking, but I don't know if I can pull it off with any great success. Sean: I like the idea of making it iron and rusting it though. That sounds cool. Maybe a bronze or copper look to it might work. Mr. Esty: I was thinking about making the flex fitting a lighter grey color to make it stand out a bit but not too much. Perhaps I could add the green places as they would be allowed to decorate or mark their armour as they saw fit (being Elites). Maybe something like squad markings or kneepads or such. But the pics I find don't have any green in them that I remember seeing. DimmyK: Another vote for the marble effect. I may have to see what I can come up with before I commit to doing it on the models. Marble can be tough at that scale. @Ron I can imagine that the only way to make the marble look good is either a mask or "painting backwards". You should at least give it a go to see how it looks. If nothing else I am pretty curious:) Didn't you make some marble bases some time back or am I mixing blogs? I cant help much with how to paint the icons but I have to say that the way you have painted the black is amazing. Its a very artistic style and very different to what Im use to seeing. Maybe just a green stripe across the knee then; but there oughtta be SOMETHING, no? Starting to look more Dark Templar than Dark Angel. I think if you are sculpting the Deathwing icons for the shoulders, red paint with edge highlights will be more than enough to pop off and get some attention on the black armor. As far as green, I would not have any as the Angels at this point have not even thought of it yet. Are you going to add the GW 80s yellow checkers? Flekkzo: It was me, but that was on a bigger scale and the base was fairly flat. I'm going to give it a go, but I'm not holding my breath. Snake88: Thanks, it's more "other" techniques than is actual painting really. MrEsty: I'm torn, I think if I add the green, it will be as an accent color and nothing to overpowering. SC Mike: These guys are right around M36 so their power armoured brethren are sporting the green... these guys just haven't jumped to the bone color yet. As for checkers and such, I may add some here and there as a bit of an inside joke if you will to the earlier way of painting and decorating armour. Looking great already, the weathering looks perfect. I have to say, I really don't think they need any DA green. There won't be any big white shields with black crosses, so the iconography alone should be enough to set them apart from the Templars. For the Deathwing icons my instant reaction was cracked red ceramic or enamel. You could try using crackle glaze, but I'm not sure how well that would work on an area as small as an icon. It may be that you'd have to mock up the effect manually somehow. Really looking forward to seeing what you do next. Da green and white checkerboard kneepads would look awesome on them! This is a great effect. 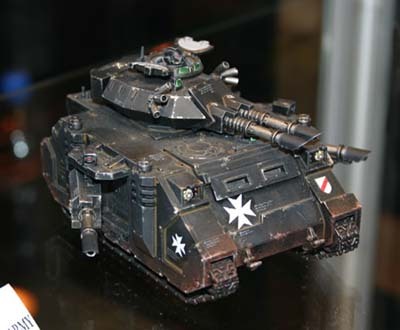 I want something similar but I have a problem, I'm doing CSM but the armour is dull red. The rust pigment doesent work as you cant pick it up. Is there anything you could suggest using different colours on red to get this effect? Mart: What kind of red? Can you email me a link or an image so I can look at what you're talking about. I know what you mean, and there is a way to fix it I'm sure. Another vote for red marble or a ruby type effect on the symbol. If it can be done it would be pretty cool I think. Also, I think the old school checks would be nice. In the olden days they looked kinda bright and... cheery? I think if you could make them look a little darker and more serious they wouldn't look out of place at all and would still be an awesome nod to the old art. The Inner Geek: I think I'll try my hand at the marble and post the resutls here along with my plans for the basing in the coming weeks. I may even try some small checks on the other legof the model to see how it looks. No promises though. Give checks a chance Ron!